Despite the government’s efforts to stop “invaders” at the border, a lot of pyramidal ice crystals could penetrate our homeland on the 3rd of April. At least 3 legions of them rushed across the country arriving from West and reaching the Eastern borders late in the afternoon. The attack had left a lot of people with severely high adrenaline levels – and a lot of excellent photographs! 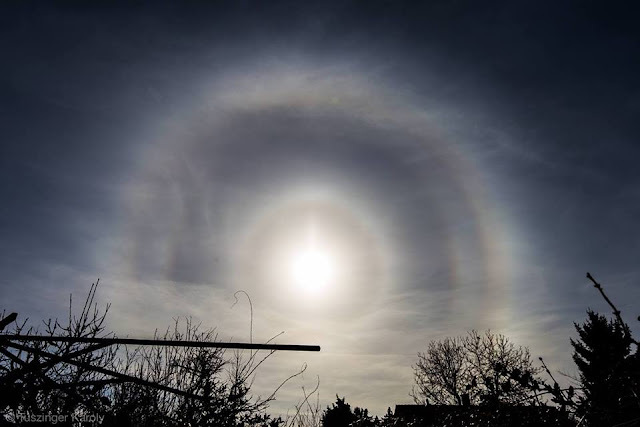 The first signs of the display appeared at early dawn when a vivid circumscribed lunar halo formed with some moondogs, faint CZA and easily visible, still faint supralateral arc. In some pics an extremely faint 9d halo was noticed later (I could not see it while being outside). 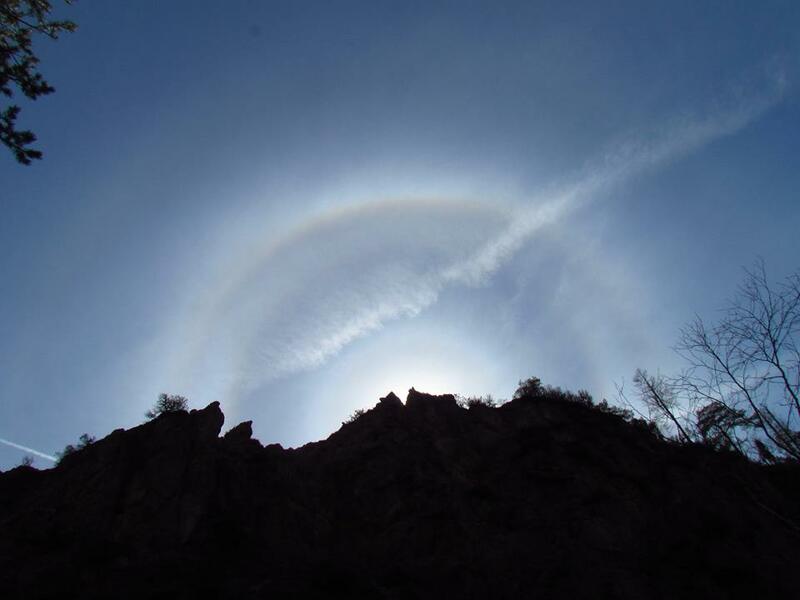 Then after sunrise in the early morning, parts of 18d arcs were visible, probably they were 18d parhelia, but this only lasted a very few minutes and they were also faint. For some hours nothing happened, then at noon another pyramidal crystal containing cirrus arrived and caused a fine display at my place which lasted for about 20 minutes. 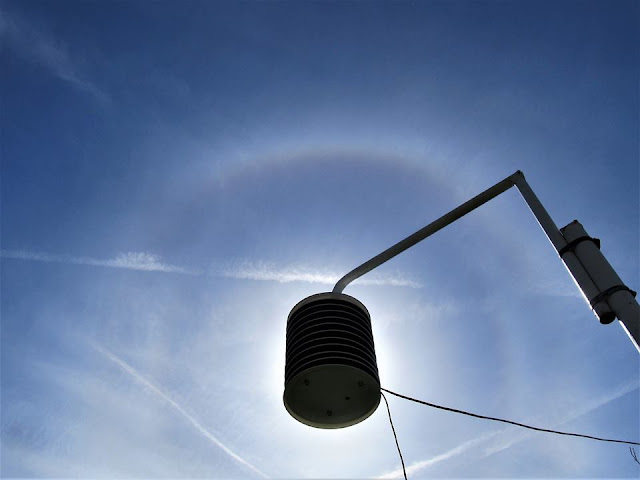 9-18d halos were well visible and also the „22d” halo’s arc was too broad to be a simple 22d halo. I took some pics around, but 35d was not present. In the meanwhile the clouds drifted towards East, they were on their way to Budapest and the surrounding area where a lot of people could observe and capture the best of the show in the afternoon. This region had received the elite commando of the pyramidal legions, with an extremely vivid display; the arcs were easily seen even on the worst quality weather webcams’ images! Webcam videos of idokep.hu: Fót and Hajdúszoboszló, Hungary. A decent full circle 9d halo with colourful 9d parhelia appeared on most pics, the full circle 18d halo with vivid 18d parhelia was also present, 23d full circles with some cases of 23d upper parhelion (or at least the arc’s colour was much more vivid at the location of the 23d upper parhelion). One wide angle pic shows signs of a very faint 35d arc too. The show lasted about an hour (at least the N parts of the capital). Then the clouds drifted on towards the East and caused a less spectacular but still fine display late afternoon. The northern half of the country was affected by the display or at least parts of it during the day. Of course this is the case when stacking would lure out more detail, but most people just rushed out from their workplaces to capture the rarity with their cellphone cameras, still the beauty of the show was that even without stacking many details were visible. I guess it was very lucky that the clouds had done their best in the Budapest area where most of the population concentrates, so many observers could capture the show. I can’t remember any similar case of pyramidal display in Hungary in the past 20 years, it was so vivid, so widespread and so complex! Those odd radius halo were like the ones I got last year.